Remember "Joe" from my post Groovy Guy Gifts: Big Slug Mug? Well .. after posting my review ... he asked if I'd like to do the same for something on another website that he is involved in. He offered to send me something from Bridesmaids Gift Boutique. To be honest, nothing really jumped out at me like a bunch of the stuff from Groovy Guy Gifts did. 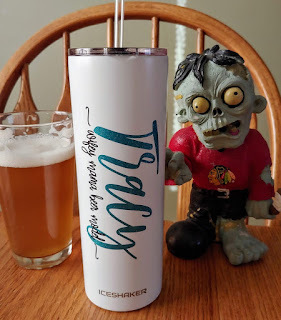 However, my wife (aka the SheppyBrew Beer Model) took a look and liked the "Ice Ice Baby" insulated tumbler. So, we had Joe send us one. The bottle had her name in big girly letters and her "title" in little girly letters. "wifey mama beer model". My wife (aka the SheppyBrew Beer Model) really liked it. Although it is a bit girly for me to use in public, I might steal it in the privacy of my own home. We'll see. I'm really enjoying this cup. I love that it's fully customizable - text and colors. 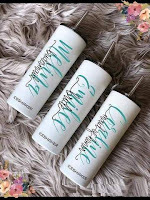 It doesn't just have to be for bridesmaid gifts. It obviously could be - but you don't even have to put "Maid of Honor" or "Bridesmaid" on it - you could put your friends' nicknames or something else so that they might be more likely to use the cup for years to come. I just got one for myself, because I've been looking for a water bottle or cup to easily drink from during the day. This cup is skinnier than some bottles I have, so it's easier for me to pull out of the cup holder. The description says it keeps drinks cold for 24 hours - so I tested this. I put ice water into it and let it sit...24 hours later there was a chunk of ice still in it and the water was cold. Nice! I haven't tried out the claim of keeping hot beverages hot for 12 hours since I don't really drink hot beverages. Another thing I like about this product is that the lid can also be used without the straw. It has an opening that has a cover that slides over it like a travel mug. I didn't know about this feature from the product description. A couple of things to note - the product description says it comes with a stainless steel straw - the one that came with mine is made of hard plastic. Seems sturdy though. The other thing is that it arrived with a small dent in it. I recommend that the company ship this item in a box rather than a padded envelope so that is less likely to happen. I did contact "Joe" about the little dent and asked if maybe the packaging was different us than it would have been for a real customer. He verified that he did nothing differently for our shipment. He did offer to get the manufacturer to send us a new one, but the dent was not that big a deal for either of us. I suspect that if we were giving it to a bridesmaid, we would have asked for a new one. The website is nice. Somewhat girly, but considering the target audience, that is probably by design. Looking through various comments, I didn't find any rating other than 5 stars. I feel like based on my interactions, I have no reason to think the customer service is anything other than great.